Whispers in the Loggia: On "A Spent Ideology" -- For Cuba, Via Miami, "A Transition Worthy of Man"
On "A Spent Ideology" -- For Cuba, Via Miami, "A Transition Worthy of Man"
Much as the last week in Latin America was headlined by B16's visit, on its final leg, no shortage of the splash came courtesy of the cleric one op's dubbed "The Caribbean Pope." If only the archbishop of Miami brought along his Harley to to ride through Havana, the triumph would've been complete. For those who know him, what ensued was merely Vintage Tom Wenski. And for those who hadn't known him before this week, while the Universal Pope was meeting with President Raul Castro, footage of the US bishops' de facto policy chief on Island Affairs made the rounds on Tuesday's Stateside evening national newscasts as the 61 year-old prelate celebrated a Mass for Reconciliation in Havana Cathedral, joined by the thousand-some Stateside pilgrims, largely exiles, from South Florida and beyond. Greeted by applause and tears, most of the group had not returned to Cuba in decades. And as the question of increasing political and religious freedoms in the West's last Communist country hovered over the visit, Miami's Polish-born, Cuban-bred, adopted-Haitian native son had a pointed thing or two to say about the island's future. 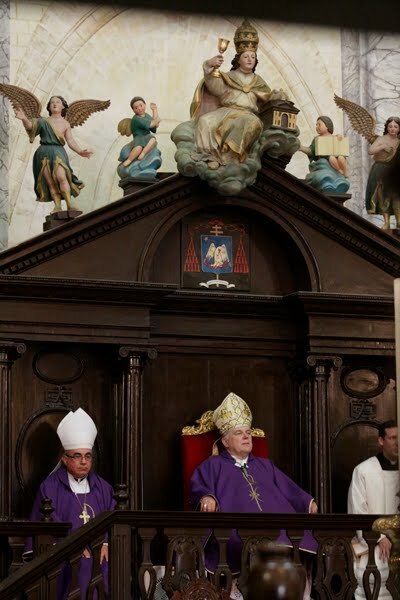 Here below, in full, Wenski's homily at the Havana Reconciliation Mass -- which, according to reports from the ground, was followed by a standing ovation from the cathedral crowd. We are, like Pope Benedict XVI, pilgrims of charity here in Cuba. We come from Miami and the United States - in our group we have people born here, the children of people born here and people of other national heritages. We are united in one common faith. As the theme of the jubilee of the 400th anniversary of the discovery and presence of Our Lady of Charity states so well: A Jesus por Maria, la caridad nos une (To Jesus through Mary, charity makes us one). Our presence here today in this historic cathedral is also another witness to this unity that is ours in the Body of Christ which is the Church. On behalf of all of us, I wish to express our gratitude to His Eminence, Cardinal Ortega, for making it possible for us to celebrate Mass in this the Mother Church of the Archdiocese of Habana. The stones of this cathedral have witnessed over the centuries the unfolding of much of the history of Cuba - with all its lights and shadows. And these stones will witness in years to come the further unfolding of the history of Cuba and its people. We come here as pilgrims to pray that - as Pope John Paul II said in his visit 14 years ago - that the Cuban people will be the protagonists of that history; and that inspired by the Word of God and the values of the Christian heritage that has shaped Cuban identity for more than 400 years, the Cuban people will build for themselves and their posterity a future of hope. In the Psalm today we prayed: O Lord, hear my prayer and let my cry come to you. The psalmist prays: "Let this be written for the generations to come and let his future creatures praise the Lord. 'The Lord looked down from his holy height; from the heavens he beheld the earth. To hear the groaning of the prisoners, to release those doomed to die.'" “God has created us as the fruit of his infinite love; hence, to live in accordance with his will is the way to encounter our genuine identity, the truth of our being, while apart from God we are alienated from ourselves and are hurled into the void. The obedience of faith is true liberty, authentic redemption which allows us to unite ourselves to the Love of Jesus in his determination to conform himself to the will of the Father." Again as the Pope said yesterday: "...when God is put aside, the world becomes an inhospitable place for man, and frustrates creation's true vocation to be a space for the covenant, for the 'Yes' to the love between God and humanity." Jesus Christ fulfills the desire of the longing of our hearts that the world may become a home worthy of humanity. For the world to become a home worthy of humanity it cannot close itself to transcendence, it cannot shut itself off to God and to our vocation as men and women to live with God, not only in this present moment but for all eternity. Ideological materialism, represented in this country and in those countries of what was the Eastern bloc, denied man's transcendence; it denied that that human person was created for more than just to die one day. As the Pope observed on his flight to Mexico, Marxism is a spent ideology. This caused a bit of a furor among the press corps; however, as Archbishop Dionisio Garcia [of Santiago de Cuba] observed, "the Pope's comments about Marxism didn't tell us anything we, in Cuba, didn't already know." However, as Cuba transitions, the Pope and the Church want a transition that is worthy of the Cubans’ aspirations, a transition worthy of man. To go from the ideological materialism of Marxism to a practical materialism such as that of many Western societies would not be worthy of man. The Church certainly wants a "soft landing" but a landing that is open to a future of hope. As the Holy Father wrote in Spe Salvi, a world without God is a world without hope, a world without a future. 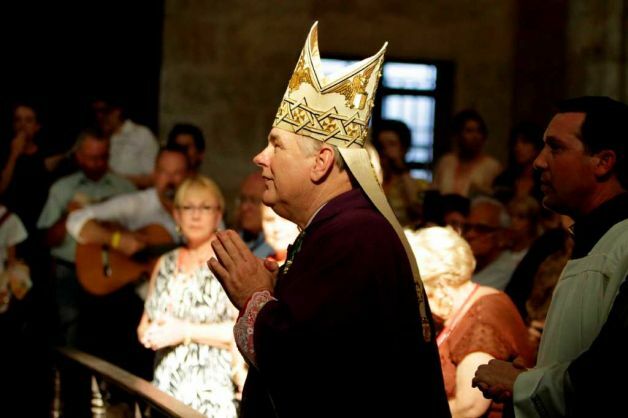 To people intoxicated with the love of power, the Church witnesses to hope by sharing with the world -- and with the Cuban people -- the power of love.